It seems that 7:30am is the perfect time to wake up when you go to bed at 8:30pm, that’s the time I was waking every day of the tour. I woke on day 6 to a bit of drizzle, with splashes of sun and felt fantastic, despite having an OSM for breakfast. On the road and the day just got more and more lovely, with mists drifting through the lush forests on either side of me. It was chillier again, but I warmed up quickly as I cruised along listening to the morning bird song and singing to myself. In no time at all I was at Lake Moeraki, which looked lovely under grey skies. Up in the forest above the lake a group of Kaka played in the trees and I felt very lucky to have seen this. A spot of food and I was on the road again with the rain started shortly after. Who names a creek The Windbag? 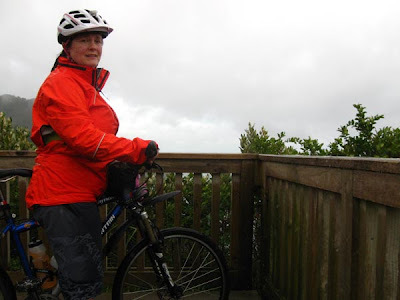 Today’s rain was gentle and pleasant and as I started the climb up to Knight’s Point I was actually loving it. It was perfect climbing weather and my new found love of climbing was rewarded with some nice undulations leading up to the lookout at Knight’s Point. I took some photo’s, but was slightly concerned about the amount of water falling on my camera, as you can see. It was amusing watching the Japanese tourists from a big bus lining up for the loos and trying to shoo the sandflies away with their umbrellas. Snickering, I headed off and had a brief chat with an English cyclist a little further up the road. Then the sun came blazing out and I took off my jacket and replaced it with the orange vest of visibility and dorkiness and continued climbing. At one point I saw a flock of at least a hundred wood pigeons. Flying together like this they actually looked graceful in the air, rather than their usual unco drunken appearance. I must have been getting hungry because they looked a bit like pies on wings to me! Zooming down the other side of the hill and I came to Ship Creek, which was where I had my first encounter with the dreaded sandfly menace. I’d done a bit of research into the best insect repellent to use of these monsters and had decided to go for the less carcinogenic and safe for clothes and plastics concoction of a 50-50 mixture of dettol and babyoil. I’ve used this before and it seemed fine. My first mistake was heading under a shelter to apply the mixture, instead of staying out in the breeze. Hundreds of the wee buggers instantly swarmed around me and as I put my helmet on a handy table heaps of them covered it, since it was still warm and fragrant. I liberally covered all my exposed skin with my mixture and while it didn’t actually repell the bitey beasts, it did stop them biting and I was happy with that. I headed out on the first of two walks at Ship Creek, this one taking me along the dunes to a lovely wetland that runs along the beach. It was amazing walk through such diverse ecosystems in a 20 minutes. 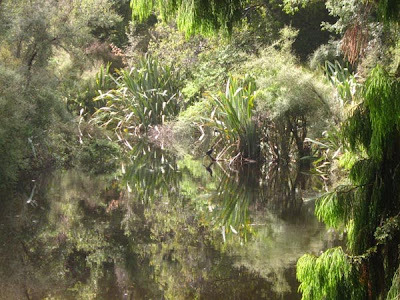 Wind-swept sand dunes overlooking the surging west coast sea, dense reed beds opening to still fresh water, and thick native forest full of bird song and wet, green life. Amazing. 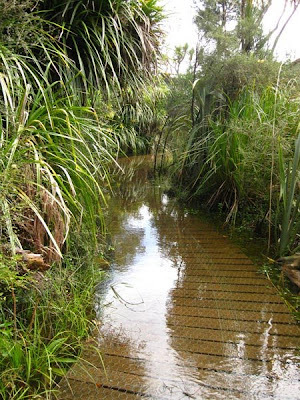 Returning to the starting point of that walk I headed off in the other direction on the swamp walk up the river. 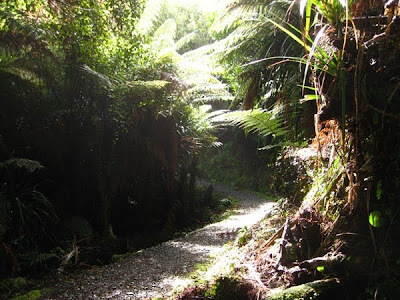 There were lots of bellbirds around, their wonderful song adding to the magic of the place. I noticed that the boardwalk at the start of this track was sitting right on the water and could see why there were signs warning it was prone to flooding. I’ve never really been into a native swamp land before and this place was amazing. The river flowed slowly by to the left with shags keeping a sentinel watch over the banks, and to the right thick forest, with water everywhere. 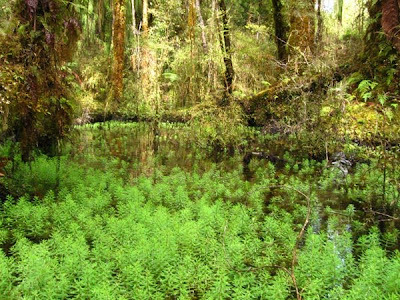 Stretches of water were covered by bright green plants which formed a rich, luxuriant looking carpet. Moss and lichens grew everywhere and water dripped constantly. Rounding a corner in the track I came to the mighty Kahikatea stand. 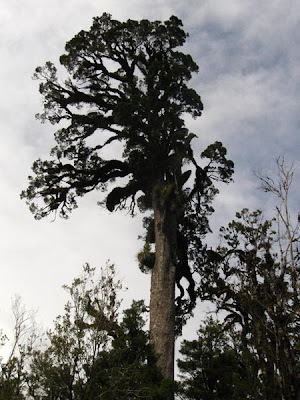 These are the tallest trees in NZ and their habitat is vanishing as their swamp homes are drained. The biggest of the trees was truly magnificent, reaching to the heavens with its crooked fingers, an old man of over 500yrs age. Returning along the track I soon discovered that flooding of the boardwalk entrance was not a rare occurrence and the boards were covered with half a foot of water. No wonder I had the track to myself. I quickly disrobed my feet and waded across. The water was cold and crystal clear and on the other side I pulled my socks back on, but not high enough (my second mistake)! I discovered on returning to my bike that I’d left the level of my left sock 5mm lower than when I applied the sandfly repellent. Well actually the sandflies discovered this first. I discovered a clutch of the little shits all crammed in that tiny space feeding on me. The mixture obviously worked for me because these were the only bites I got when wearing it. After dispensing with them I sat on the beach listening to the thunderous roar of the sea. It is always so angry on the west coast, just the way I like it. Huge waves smash down on the beach, sending spray high into the air, filling the breeze with salt. Unfortunately my stomach was telling me it was time to move on, so I headed off down the road. Not far from Ship Creek I got to Haast Junction and rolled into the pub there for a huge burger and a beer. The pub was incredibly depressing, filled with extremely old people, munching their lunches. I sat in the corner fuelling up and writing, finding the whole atmosphere surreal. 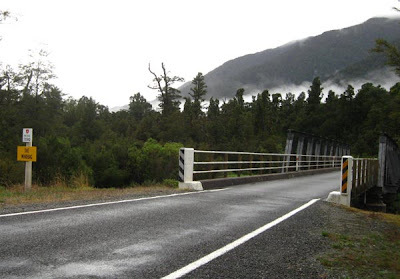 I was happy to get back on the road and get to Haast a few minutes down the road. 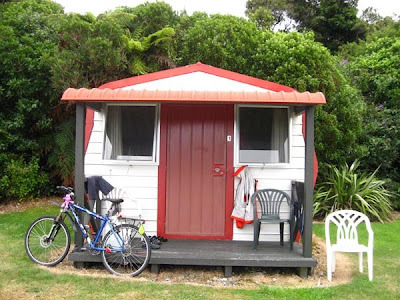 I got myself a little tin cabin at the camping ground and head to the shop for supplies. Another pleasant evening was spent reading, eating and giggling at the wood pigeons that seemed to fall out of the bush behind my cabin on to the tin roof with an almighty clatter. Later the rain started up, drumming hard on my metal roof and I drifted off to sleep before it was dark. Tour debrief – Were those new pants good?